It remains unclear if Wansdyke ever used the Roman Road as a boundary, instead of the defensive bank and ditch used by East and West Wansdyke, However, medieval names point at least to a belief that it did. Wansdyke, or rather the Roman Road, possibly starts at Bathford, climbing the hill to Norbin farm. By car from the direction of Bath. Follow the A 4, which is the Roman road which is called the Fosse Way, to the Batheaston roundabout. There take the road to Bathford, and continue to Kingsdown. Do not go left into the village, but continue uphill, after which take a right turn at the crossing on top (to South Wraxall). Just before Hazelton Wood youll cross the main power line. The remains still visible should be left of you (eat), skirting the north end of Chesland Wood. By car from the direction of Chippenham or Melksham. From Chippenham: follow the A 4, which is the Roman road which is called the Fosse Way, to the Batheaston roundabout. Then continue as described above. From Melksham: follow the A 365 to Atworth and Box, which first crosses the Roman Road at the entrance to Neston Park. 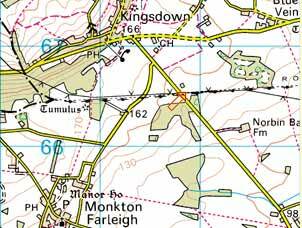 At the Wormwood Farm crossings, take the road left to Kingsdown, until you reach the crossing on top (to South Wraxall). Then continue as described above. By car from the M4. Take the motorway exit nr. 18 at Dodington Ash, and follow the A 46(T) south to Bath. Youll pass the 577AD battlefield of Dyrham, which may be well worth a visit. Anyhow, continue to the Batheaston roundabout. Then continue as described above. By car from the directions of Bradford-on-Avon or Trowbridge. From Bradford: take the A 363 to Bath, and at Pinkney Green turn right to Monkton Farleigh. Continue to Kingsdown, but after you pass underneath the main power lines, go right at the crossing. Then youll cross the main power line again. The remains still visible should be left of you (eat), skirting the north end of Chesland Wood. From Trowbridge: take the A 363 to Bradford, then continue as described above. Alternatively from Bradford: take the route through South Wraxall. First look for the B 3109 to Corsham, but in South Wraxall take the road to Kingsdown. When you pass through Hazelton Wood, you'll cross under the main power line mentioned above. Alternatively from Bradford  a visit on foot at Lodge Farm: take the road to Monkton Farleigh as described above, but go left at the second crossing north of the village. After 300 metres a footpath goes right, heading for a woodland (Kingsdown Plantation), and on your left an ancient tumulus (burial mound). The Roman Road should be found where the footpath reaches the north end of the woodland. This stretch is one of the very few places where the Roman Road is visible west of the Avon. It lies east of Neston Park, which can be seen to have been delineated by the remains of the Roman Road, which also formed the parish border here. It is best approached from the village of Atworth to the south. By car from the directions of Bath or the M4. From Bath: follow the A 4 to Chippenham, and at Box take the A 365 to Melksham. At Atworth take the minor road left to Neston, until you reach Medley Cottages. Here the Roman Road can be found crossing the road at a right angle, but any remains should be visible to your right (east). From the M4: take the motorway exit nr. 18 at Dodington Ash, and follow the A 46(T) south to Bath. Youll pass the 577AD battlefield of Dyrham, which may be well worth a visit. Anyhow, continue to the Batheaston roundabout. Then continue as described above. From Chippenham: follow either the A 4 to Box, or the A 350 to Melksham, and at either destination, take the A 365 to Atworth. At Atworth, take the minor road north and continue as described above. Alternatively from Chippenham: take the minor roads across the country, which are much more beautiful and quiet. Take the A 4 to Corsham, and there follow the B 3353 to Gastard. But before leaving Corsham, go right just after crossing the railroad to Leafield and Neston, which you can reach from different directions. The crossing you need to find leads to a road south through Neston Park (which I hope is open to the public! ), that crosses the Roman Road north of Medley Cottages. 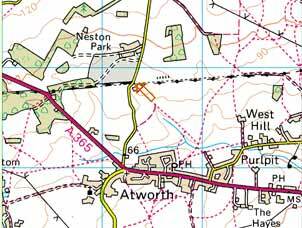 Follow the A 365 to Atworth, then continue as described above. From Bradford: take the B 3109 to Bradford Leigh, there go right to Atworth, there cross the A 365 and continue as described above. From Trowbridge: take the A 361 to Devizes, then the A 350 to Chippenham and the A 365 to Atworth, then continue as described above. This stretch is possibly the best place to see the Roman Road west of the Avon. The remains of the Roman Road, which extend to a mile or more here, can be observed on both ends of the B 3353, and several footpaths lead to it. Remains can be seen from the main power lines up to the railwayline. From Bath: follow the A 4 to Chippenham, and at Box take the A 365 to Melksham. At Shaw take the B 3353 to Whitley and Corsham. Take note: after leaving Whitley, about 500 metres after crossing the main power lines, a by-road can be found to your right  you best park there. From here, two footpaths go north and east, both leading to remains of the Roman Road. Other remains can be seen west of the B 3353, about where the mast of the power lines is closest to the road. From Chippenham: take the A 350 to Melksham, which crosses the Roman Road at Inwood Copse. Continue to Beanacre, where you best take the minor road right to Whitley. Go right again at the B 3353, and continue as described above. Alternatively from Chippenham: take the A 4 to Corsham, and there follow the B 3353 to Gastard. And Whitley. Look for the by-road on your left, which should appear before you cross the main power lines. Best park there and continue as described above. 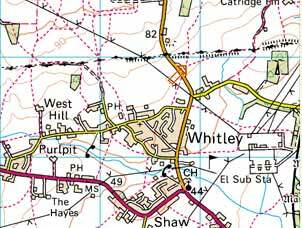 Take the A 365 to Shaw, go right to Whitley and continue as described above. Follow either the A 4 to Chippenham, or the A 3102 to Melksham, then continue as described above. click here to return to 'Mid' Wansdyke, section 5.